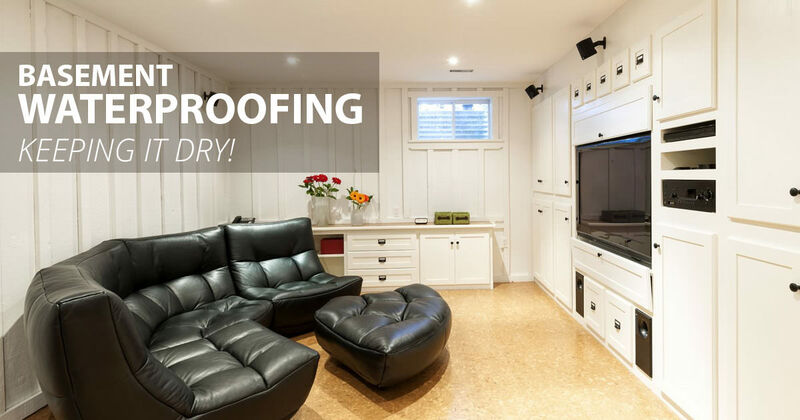 How to waterproof your basement & keep it dry! When rain has nowhere to go but into your house, you’re going to have a problem! Proper drainage is KEY to waterproofing your basement. Fill in the cracks and crevices in your foundation and walls with concrete sealers to prevent leaks. 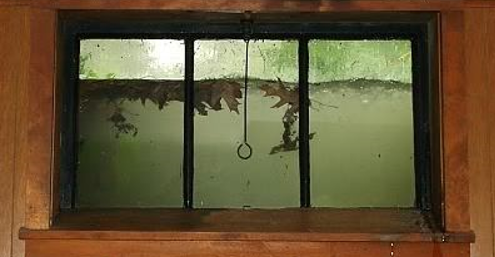 Check the seams of your basement window for a proper fit. Basement floods start at your roof. Check your gutters for overflowing areas during heavy rainstorms, and be sure to keep them clean year round. Keep scrolling for more waterproofing tips! Yikes! This window well is completed flooded, notice the small leaks coming in from the basement window seams. Discover our top 7 tips on waterproofing your basement. Follow these to prevent basement floods and leaks and to prevent the dreaded “wet basement”. A large majority of issues with water build up around the edge of the house happens because of improper drainage of water off the roof. Make sure your gutters are clear of debris and all drainage pipes are properly directed away from your house at least 6-10ft and are sloped away from the house. Gutters should be installed on every roofline that is parallel to the ground, including over windows and doors. Next time there is a thunderstorm, grab an umbrella, head outside, and take a look at your gutters. Gutters too small may not be able to properly move the water fast enough down the drainage pipes. If you see overflow from the edge, you either have a built up problem with debris, or your gutters aren’t large enough. During the winter snow may begin to build up inside an exposed window well, which could eventually leak into the basement through the basement window or cracked foundation. During the summer, intense rainstorms can pool water up to a few inches in a matter of minutes. 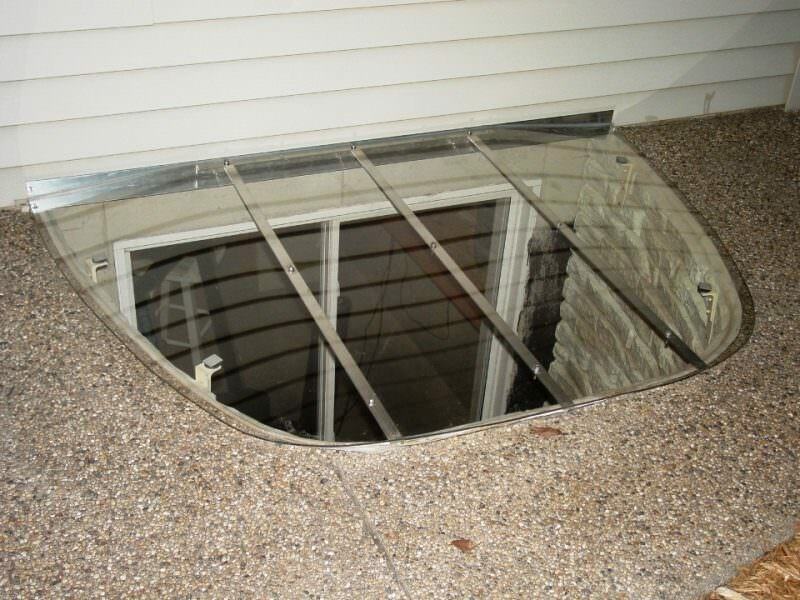 A properly fitting window well cover can protect your well from rain, snow, and debris build up and prevent basement leaks. Most homes built up to code have proper drainage systems put in place for window wells, drawing water away from the home with a weeping tile system. Take a look to see if any water is pooling in your window well, this could indicate a problem with your drainage system. Improperly installed basement windows could lead to basement leaks if your window well gets exposed to too much water, or you do not have a window well cover installed. Check for cracks around the edges and seal with caulk if necessary. Older windows may leak at the seams even if no visible cracks are there! If you have an unfinished basement, you can easily apply concrete sealers to your walls and foundation in order to seal up microscopic cracks and crevices that water may seep through. Many big box stores sell concrete sealers that can help you waterproof your basement and come with easy to follow instructions to do it yourself! A permanent solution to basement flooding could be to install a drainage membrane along the foundation wall that will channel water along the outside of the basement wall toward the foundation drainage pipe. Installation would require extensive excavation on pre-existing homes and may not be a costly solution for many. If all else fails, now it’s time to bring in the big boys… if you have a ton of water build up in your wells or around your foundation, you may be in need of a sump pump to move the water away from your foundation through a discharge pipe. EXPERT TIP: Concrete sealers won’t be able to fill in large cracks in your walls and foundation. Before applying the first coat of your concrete sealer, use a self-hardening polyurethane caulk to fill the big gaps first! Ask your friends and family for referrals – the best kind of assurance is usually word of mouth referrals from those you trust! Find someone who specializes in basement waterproofing. Many contractors will be able to help waterproof your basement or fix leaks, but companies that specialize in basement waterproofing have many years of experience with all different types of leaks and have the expertise needed to make sure your basement won’t flood again. Make sure your contractor is licensed, bonded, and insured to work in your area. Don’t rely on their word, check out websites such as AngiesList and HomeAdvisor to double check! Our favorite place to find basement waterproofers? Visit AngiesList, don’t forget to read reviews and screen your contractors before signing anything!